The general shipping method for used vehicles into New Zealand is either through RORO (Roll-on, roll-off) ships that land at either Auckland, Wellington or Lyttleton. RORO is the cheapest way of shipping though a container can be arranged if requested. There is no special test like JAAI required for New Zealand. Cars and vehicles into New Zealand do not require anything apart from the standard documentation required for exporting out of Japan (export certificate). Provide Cars arranges this. We do recommend having the odometer checked and where possible (depending on the shipping line) doing MAF clearance in Japan. Provide Cars arranges this. There are no age limitations for vehicles going into New Zealand. HOWEVER, if you desire to comply your car in New Zealand (the first step in registering it for the road), then you must comply with the latest emissions standards which basically keep the petrol cars younger than 2004/2005 and the diesel ones 2008/2009. It is very important to understand that we at Provide Cars will guide you through this when you are bidding. You are NOT on your own. Basically what the law is saying is that for either petrol or diesel vehicles, the emission code, as is circled in the above auction sheet, must have 3 letters in the code. In the above example; DBA. 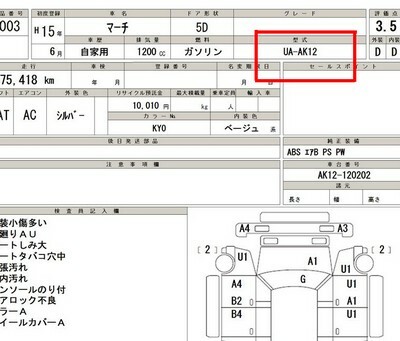 In the second example below, the emission code only has 2 letters in its code (in this case UA). Although it is still importable, it is no longer compliable (or can be registered) in New Zealand. There is also a 20 year old law in New Zealand that allows an individual to import a vehicle that is 20 years old or older.